From a long history and deep experience come surprising facts about precious metals and their connection to TANAKA. In this column, we discuss the history of TANAKA Holdings, with a multi-faceted view of precious metals. Japan’s second gold boom started after the price of gold dropped through 3,000 yen per gram in November 1981. It was then calm for about two weeks before the gold price again started its downward trajectory in a collapse that took the price to 2,475 yen per gram by March of the following year. However in August, an international financial crisis was triggered by a plunging Mexican currency, which reversed the international gold price decline and the domestic price also followed suit, rapidly rising over just six months from the March low to a September 9, 1982 high of 4,220 yen per gram. Customers who had bought gold during the boom then decided it was time to sell, so the bullion business was again rushed with orders as the country was swept up into a third gold boom. Again, long queues of people formed at our retail shops, with people arriving at 5pm not going home until after 9:30pm or so. Mr. Hodgson, our advisor at the time and former director of precious metals producer Johnson Matthey in England, witnessed this gold boom for himself and commented ironically; “Japan is a country at peace.” With the price of gold increasing because people overseas were converting assets to gold in fear of unstable currencies, Japanese people on the other hand were busy selling gold. As a gold specialist, his ironic comments made real sense. TANAKA and the International Gold Corporation (InterGold), the company selling the Krugerrand gold coins, had a difference of opinion related to how to set the spread. The spread is the difference between point-of-sale selling price and buying price, and the wider the spread the greater the profit for the retailer and the more eager they are to sell. Naturally, we tried to increase the spread out of a necessity to develop our retail stores and promote sales, but InterGold demanded the spread be reduced. They insisted on a “pull strategy for the gold coins rather than a push strategy,” wanting customers to come to us to buy rather than us going to them to sell. We eventually reached an agreement and had to compromise on the spread. Our sales target for the first year after release of the coins was one million gold coins, which was 100,000 ounces or about 310 kg. Spending an unprecedented amount of one billion yen per year on advertising, we were flooded with orders from department stores and precious metals retail shops at the December 1980 release of the coins. As a result, we easily exceeded our first year’s target, weighing in at 180,000 ounces, or close to twice our target. Source: From “Occupied Tokyo,” published by Gekkan Okinawasha. Additionally, the photos have previously been made public. 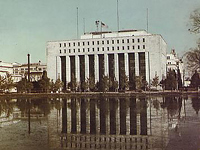 Immediately after the end of the Second World War, precious metals in Japan came under the control of the General Headquarters of the Allied Powers (GHQ). Seizing about 113 tons of gold, 2,416 tons of silver and 4 tons of platinum, GHQ confiscated any and every precious metal in Japan. At the time, GHQ ordered increased production of rice and coal to help the country on the road to recovery. 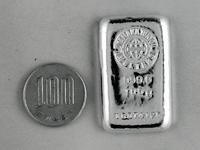 Platinum was essential for manufacturing chemical fertilizers and blasting powder so TANAKA was also enlisted to source the platinum material. However paper currency from the Bank of Japan was no good for the GHQ surplus platinum, so when domestic mining enabled the purchase of gold, we were finally able to start sourcing the platinum. In due course, the Precious Metals Control Law was enacted in 1950, with the Japanese government essentially inheriting the GHQ policies. The law stated that all domestically produced gold be bought by the national government and allotted where required, and that market transactions be subject to an approvals system. In 1953, the law was completely revised into the Gold Control Law, which allowed for a portion of the allotted domestic gold production to be freely sold. With the precious metals industry finally emerging from these darkest of days, we were finally able to see some signs of hope.